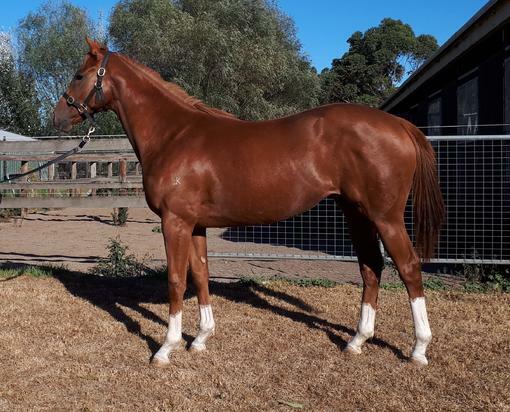 HELMET (AUS) (Chestnut 2008-Stud 2012). 6 wins-4 at 2, MRC Caulfield Guineas, Gr.1. Leading First Season Sire in Ire. in 2016. Sire of 306 rnrs, 139 wnrs, inc. SW Thunder Snow (Meydan Dubai World Cup, Gr.1), Anda Muchacho, Archives - Lean Ambassador (H.K. ), Limestone, Met Spectrum, Eqtiraan, Taamol, SP Crossing the Abbey, Mur Hiba, Malaise, Finniston Farm, Boater, Wingingit, Igitur, Coppergate, Sunquest and of Cheeseandpickle, Metronome, etc. APPROACH ME, by New Approach. Winner at 1000m, MRC (Mornington) Land Engineering P. This is her first foal. Miss Vixen. 2 wins-1 at 2-at 1000m, 1100m, A$142,350, to 2017-18, MRC Bert Bryant H., 3d MRC Mypunter.com H., Moorookyle Park H.
Approach Me. Winner. See above. Henry George. 2 wins at 1100m in 2016-17 in Aust. STIRLING GROVE (Mossman). 7 wins-3 at 2-to 1400m, A$546,690, SAJC Sires' Produce S., Gr.3, MRC Premier Signs P., SAJC Adelaide Casino Cup Day H., Vodafone 2YO P., Schweppes Fulham Park 2YO P., VRC Schweppes Tonic P., My Room P., 2d SAJC Jansz S., Gr.3, MRC Doveton S., L, SAJC Manihi Classic, L, Allan Scott Park Morphettville Flying H., VRC Emirates Airlines H., 3d SAJC Goodwood H., Gr.1, MRC Schillaci S., Gr.2-twice, SAJC WH Wylie H., L, 4th SAJC DC McKay S., Gr.3. Vintage Grove. 4 wins from 1350m to 1950m, A$104,910, to 2017-18, Oakbank RC Big Screen Video H., SAJC Hughes Limousines H., 2d SAJC Rewaaya P., Mac Drink Driving Grow Up H., 3d Gawler & Barossa JC Ausbia Electrical H., SAJC Hughes Limousines H.
Courtza King. 4 wins at 1200m, 1400m, A$196,540, to 2017-18, ATC Cellarbrations H., BRC Prive249 Restaurant P., SCTC Coolum Business & Tourism H., 2d ATC Tab.com.au P., BRC Relaxed Racing H., GA Season Pass H., Qld Tatt's RC Ubet H., 3d ATC All Too Hard at Vinery H., TAB Rewards H.-twice, BRC Nugrow P.
Liberty Rock (Rock of Gibraltar). 4 wins-1 at 2-to 1400m, A$106,025, MRC Le Pine Funerals H., Sportingbet Best Tote H., 2d VRC Talindert S., L, 3d MRC Jimjoca H.
Exceltic (Excelebration). Placed at 2 in 2017-18, 2d ATC Pierro 2YO P., 3d ATC Canonbury S., Gr.3. Refined Treasure. 3 wins at 1000m in 2017-18, HKJC Li Cup, Bonham H., Amethyst H.
Irish Opera (Stravinsky). 10 wins at 1400m, 1600m, NZ$238,800, ARC Speight's H., 2d ARC Easter H., Gr.1, 3d BOP RC Japan-New Zealand International Trophy, Gr.2.